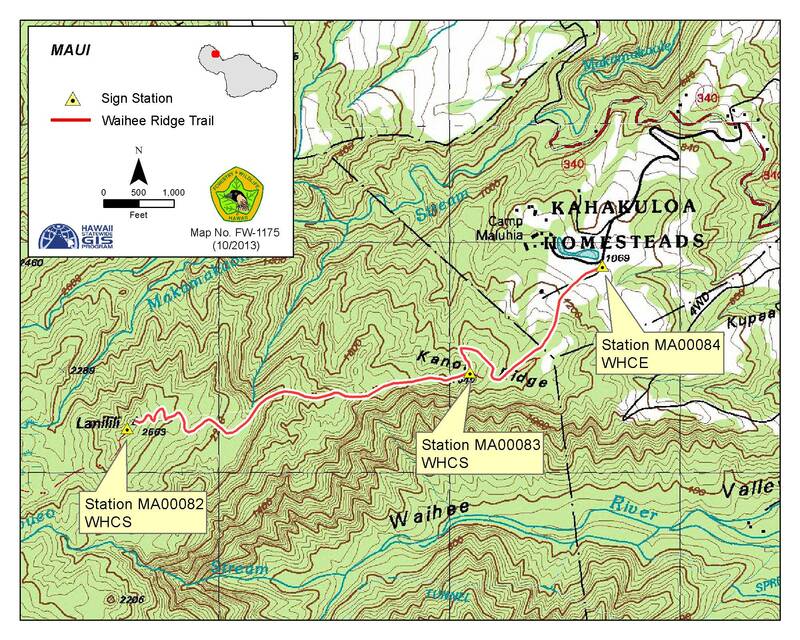 WAILUKU — The popular 2.5 mile Waihe‘e ridge trail that climbs the windward slope of the west Maui mountains will be closed for approximately two months, starting in January, for trail improvements. The trail parcel is owned and operated by the Department of Land and Natural Resources (DLNR), Division of Forestry and Wildlife (DOFAW), who will close the trail from January 3, 2017 to February 28, 2017. Managed as part of the state’s Nā Ala Hele Trails and Access Program, Waihe‘e ridge is one of Maui’s most popular hiking trails, providing hikers with panoramic views of East Maui and the Waihe‘e valley. It has been a favorite of the public as well as other community organizations since it was created in the 1960’s by state forestry staff to plant trees. Currently, the trail has issues with trail stability due to wetness and other drainage-related issues and is subject to erosion. Viewpoints are also in need of enhancements. The proposed project is to conduct a series of trail improvements along the 2.5-mile trail. The work will be done by contractor Trails Unlimited LLC, with some assistance from the Maui DOFAW Na Ala Hele Trails and Access Program staff. Project cost is $27,000. The improvements are intended to update the trail to improve public safety through surface improvements, drainage upgrades, and vegetative management. Related improvements include storm water mitigation upgrades to the trail, and the construction of two new observation platforms (summit and valley overlook), benches and picnic tables, which are intended to enhance the existing trail system experience and bring the trail up to current trail improvement design standards. The trail will be closed during this period to ensure public safety. The public’s consideration and cooperation during this time are appreciated. Any questions or comments may be directed to Torrie Nohara, Na Ala Hele, Trails and Access Specialist at (808) 984-8100. A Chapter 343, HRS, EA (Environmental Assessment) demonstrated that construction and operation of the proposed actions will not result in any significant effects to the environment. Pursuant to Chapter 343, HRS, a Finding of No Significant Impact was determined, and an Environmental Impact Statement was not required. The documents and maps available on this site are in Adobe Acrobat PDF format. To view them, download Adobe's free Acrobat Reader by clicking here.